Moujaddara is full of nutrition, and once you make up your mind that you like it, it may become a regular in your diet. Moujaddara comes in two main versions, as Moujaddara or as Moutaqtaqua, which at times can be confusing. 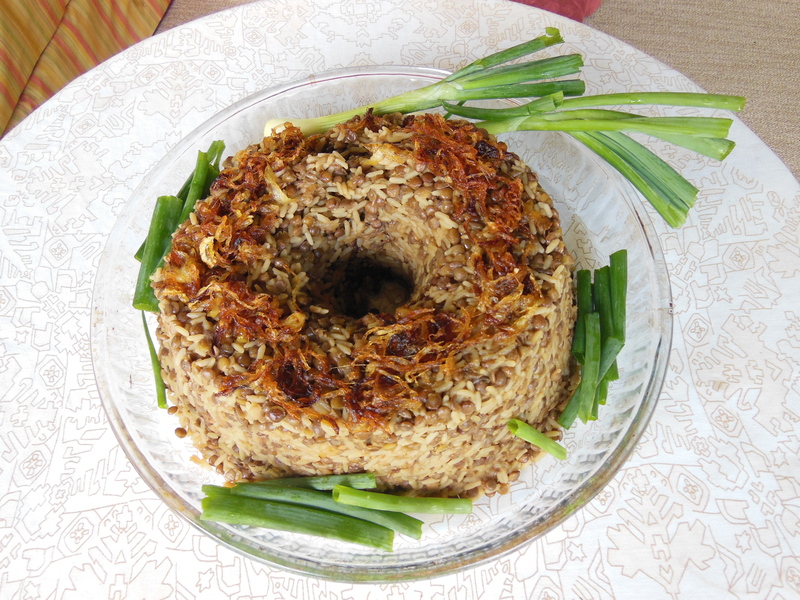 Both versions use the same ingredients, and are cooked similarly with slight variations: Moutaqtaqua (photo below) contains more rice, the onion is fried only until golden in colour and the casserole is left to simmer for less time, resulting in that Moutaqtaqua is lighter in colour, the grains retain their form, and its taste is less intense. Here presented quite decoratively in a mold and topped with deliciously sweet deep fried onions, by Lourdes my daughter in law! Remove any foreign matter from between lentils. Wash and drain. Place in a heavy cooking pot, add 625 mL (2 1/2 cups) water and place over high heat until it reaches a fast boil. Lower heat, cover and cook for 30 minutes or until tender. In a heavy frying-pan, fry onion in oil until very dark brown. Pour over lentils. Add rice, salt and remaining water; bring to a boil. Lower heat, cover and cook for 30-35 minutes, stirring occasionally until mixture is thick and set. Add remaining olive oil, mix and remove from heat. Spoon into individual bowls or pour into one large bowl and cool to room temperature. Moujadarra will keep for a day or two. Serve with a Middle Eastern garden salad: dice of tomato, cucumber, radish, parsley and mint, with a dressing of salt, lemon juice and olive oil. Spoon a bit of both, the Moujadarra and the salad onto your plate, and scoop a bit of both onto your spoon for a melding of tastes! Note: Many people like it with yogurt instead of the salad; spoon yogurt over the Moujaddara, minimally mix and eat. Some also prefer to eat it with only bread and onion. Olives – what about the olives?! Surely, have those also! Sorry to say that I had to adjust the many things. I have doing Mjadaraa with Burgoul for long time, but I want to try this time with rice. I found out that the water to cook the lentil was not enough so I had to add more water. Also, the 1/2 cup of rice was not enough for the 1lb lentil. Also, when I added the 1/2 cup of rice and the amount of water that mentioned in the recipe I found out that this amount of water was not enough at all. I kept adding water to a one cup so the rice will be cooked. But turned out is ok.